Well, it’s mid March; I’d say it’s time for an update. 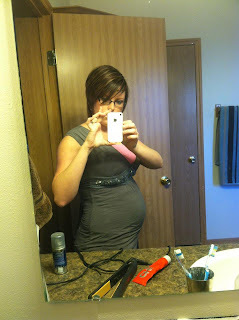 I am almost 30 weeks into my pregnancy. It has been a great experience so far. Axton is starting to move A LOT. His most active time of day is right when I get into bed every night. We have stayed up late several nights just watching him roll around. People ask what it feels like when the baby moves- I’ve heard a lot of people say at first it feels like butterfly kisses. To me, at first I was thinking it was just gas bubbles! My mom and her only brother were both adopted, so my grandma never got to experience what pregnancy was like. So the other day she asked my mom if when the baby kicks it feels like your cheek does when you move your tongue up the side of it. Before I felt him kicking that’s exactly what I would have imagined. After thinking of how to describe it for the longest time, I came up with what it feels like! To me it feels like when my eye is twitching. You are totally aware of it, but have no control over it. Anyway, it is a great feeling. 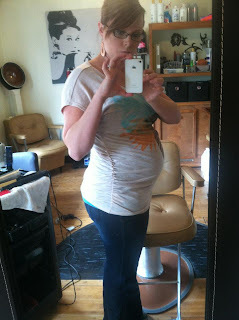 I’ve had several moms tell me that I will miss the feeling of him in my tummy…. But I can’t imagine missing it when he is here, and I’m able to cuddle with him. This year was leap year, which means Shelby, Taylon’s baby sister turned the big FIVE! My mom and I were headed out to my sister’s house in California on leap day, so we met Shelby, and Taylon’s family at IHOP on our way out of town. We were happy to be able to spend the morning with them. My sister was due to have her first baby the next day. I was crossing my fingers that Sterling would make an early appearance, and share Shelby’s birthday with her…. But Sterling thought otherwise. We arrived to Stevie and Logan’s house around 9 that night. My mom rubbed Stevie’s feet with some essential oils right before we all went to bed. The next morning Stevie text me around 6 to see if I was awake, and told me to keep her company down stairs. I went running down, to find out she had been awake for several hours timing her contractions! We were sure Sterling was going to be born right on her due date. We decided to wait awhile to have her go to the hospital because her contractions weren’t very intense, or close together. So, we went to get pedicures, and went to lunch. After lunch Stevie and Logan went home to call the hospital. My mom and I took our time getting back, and about the time we got back to their house, they decided it was time to go see how close Sterling was to arriving. They checked in to the hospital, and a couple of hours later we went to join them. Stevie was in quite a bit of pain by the time we got to the hospital, but not long after they administered her epidural, and she was in heaven. She kept telling us she thought they had given her too much medication because she felt so good. She was pretty funny! After being in the labor and delivery room for several hours we decided she wasn’t getting too close, and we’d go get some dinner. When we got back she hadn’t progressed much, so we went home to rest and got back to the hospital around 4 the next morning. Stevie’s water still hadn’t broke, so her nurse came to check her and said she’d be “aggressive” to try to break her water, well it worked. Stevie kept telling us her baby was going to be a 10 pound baby, but after she lost all of her amniotic fluid her estimates went down. Sterling was born at 6:50, and everything went perfectly. Stevie had a textbook pregnancy, and delivery. Sterling looks just like Logan’s family. She is adorable, and has WAY more dark hair than I would have imagined Stevie’s kids to ever have. She is the happiest, smiling baby. She already sleeps most of the night. I am going to be so happy if Axton is half as good of a baby as Sterling has been. I wish they lived closer; I just love them so much! Sterling, the day after she was born. 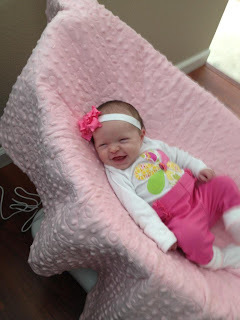 She is such a smiley baby! Stevie & Logan will be blessing Sterling Easter weekend. Then a couple of weeks later Stevie and Sterling are heading home to throw mine and Axton’s baby shower. We are ecstatic to see them! I’m hoping Axton will decide to be born before Stevie’s maternity leave is up so they can make another trip home to meet him. My grandma is getting all packed up to head home from her mission this Friday. She has loved her time in Salt Lake, and said if they’ll let her she wants to go back during the winter. I am happy that she has found something she loves so much. It is so good for her to keep busy, and that she does! I haven't been riding my horses at all this spring. Usually it seems like a chore to go riding, but this year it has been killing me that I can't go. I'm hoping Axton will be a trooper, and like to go on rides with me in a baby carrier... We'll see though! Taylon hasn't been able to go snowboarding much this year because of the lack of snow. However, he has been snowmobiling several times with the guys from work, and he LOVES it. I thought snowboarding was a big expense, I'm scared to see what happens next winter when he decides he's a dedicated snowmobiler. He has started riding his bike quite a bit. This past year Taylon has started making videos of his experiences- like riding his bike, snowmobiling, and snowboarding. He is so talented, we're hoping one day it will pay off and he can start doing freelance work for websites, and magazines. I just love how much Taylon loves life, and that he's able to document it. Everything at our store is still going great. Everyone is getting ready for summer, and starting their shopping early. The tanning beds have multiplied on how busy they’ve gotten. Taylon has been working quite a bit; they have him training to be an engineer. He loves his job, and is grateful to work with some of his closest friends. We are so thankful for how perfectly everything has worked out with our careers, and the way they’ve timed our lives perfectly to enjoy our little bundle of joy! Well, that’s about all that’s new in our lives. 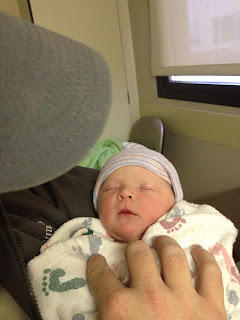 I hope to be updating soon with news on Axton’s arrival…. 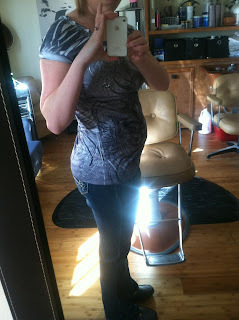 I’m giving him 6 more weeks before I’m ready to introduce him to the world! Our lives are going PERFECTLY. It’s pretty amazing to me that you can go through life expecting to know what your future holds, when indeed, you have no clue. But nonetheless, life makes you happier than you could have ever imagined! Taylon loves his career at Skyline Mine, and has learned so much from his experiences there. He has really matured a lot this past year. He even keeps up on POLITICS… who would’ve thunk?! He is still taking college classes one, by one. I’m hoping he’ll declare a major sometime soon, but he is so passive, he will just keep taking classes until he decides what is perfect for him. We are so different in the way I will decide on something at the drop of a dime, and regret it later; he gives decisions a LOT of time before deciding. While it drives me crazy sometimes, I know it’s one of his quirks that keep me grounded. I am still running the boutique (which is the best thing that ever came into my life, after Taylon, of course! ), and doing hair from home. I have a couple of ladies helping out at the store, so I haven’t had to work nearly as much as I did the first couple of months we were open. I truly love my career, although, it is one of those things I would have never imagined myself doing. I swear, you sit back and enjoy the life you are living, and God will guide you right where you need to be. Over Labor Day a bunch of our friends went to Yellowstone to visit our friend Parker, who was working up there for the summer. We had such a blast! I am so grateful for our group of friends. We always joke around about having “family trips,” or “family dinner” together. We hope we will always be close with them, they are the best! Then, a couple of weeks later we had agreed we would go to Park City to a snowboarding movie premier the week later than my birthday/anniversary. So we were thinking for our actual anniversary we would take it easy and just enjoy each other’s company. Which we did, by going for a 4 wheeler ride up the mountain with Taylon’s sister, Teasha, and her hubby Tyler, Chet, and Parker. It was the most beautiful day for a ride. When we got home Taylon said lets go up north, we got in the car and hit the road (me thinking we would just go where ever our hearts led us.). Taylon had already planned the day out, without me knowing a thing! We went to Orem and picked up sushi to-go, and he took me up Provo Canyon to ride the ski lift at Sundance Ski Resort. We enjoyed each other’s company, while chowing down on sushi, in view of the changing colors of leaves. How did I get so lucky to have such an adorable husband? I love him so much! The week later, we went to Park City with all of our friends, and had the time of our lives in our hotel room, the movie premier, and then hitting Main Street to enjoy dancing. When we were still dating we had agreed that we would wait until we had been married for a year before we would try to get pregnant. Me, being as impatient as I am had read an article saying most couples try for an average of 3 months before conceiving. So, I talked Taylon into ‘not being careful’ sometime around July. We hadn’t started keeping ovulation until September, since that was what we agreed on. The first week in October I was about 2 days ‘late,’ so we went to Wal-Mart to pick up a pregnancy test. Taylon kept teasing me that I was only 2 days late, and that I probably wasn’t pregnant. So we went home to take the test. He came into the bathroom with me as the test changed colors. His face was pretty priceless when the test proved him wrong. I know he was just teasing me to prepare me not to get upset if it was negative… but I think in the process he convinced himself that we weren’t pregnant. 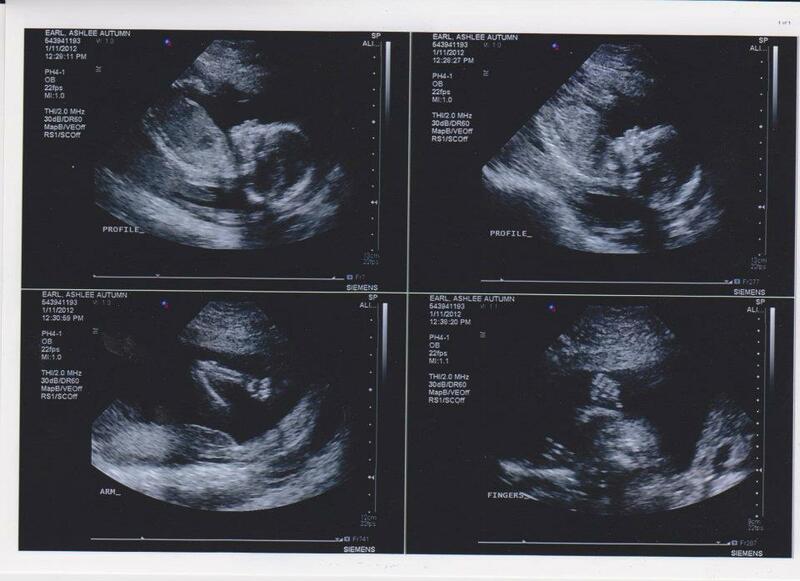 Anyhow… we are due June 8th!! We can’t even wait to meet our little one! The funniest part about our “1 year until we conceived rule” is that our actual ‘date of conception’ is our anniversary! I’m telling you, God has a plan for us! 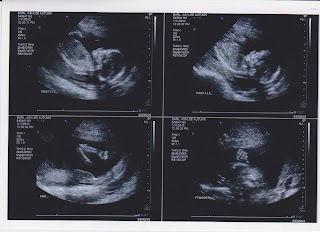 A week before Christmas we decided we would cheat, and go to the mall to Fetal Photo’s to find out the gender of our baby. We figured it would be a lot more fun for everyone to know what it was before Christmas. At 15 weeks we found out we are getting a little BOY! I had been having a hard time deciding on a name. I found several I liked, but my picky hubby was not giving into many of them. He was settled on Tate, which I liked, but didn’t love. 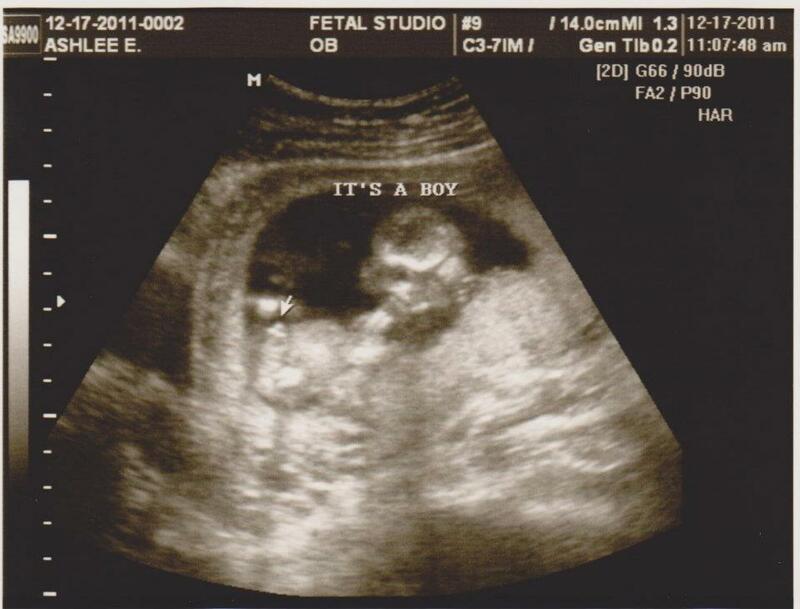 Then we thought it would be really cool to name him after one of Taylon’s favorite motocross riders, Jeff Emig. We had decided on Emig, and had started to tell our closest friends, and relatives. Luckily before we were determined that was his name, we told Dave, Taylon’s dad. He just said “Emig Earl. You are really going to name your son ‘I’m a girl?’ That would be kind of rude.” Right he is. So that went out the window pretty quick. We have settled on a name that we both love, Axton David. Although, we are only 20 weeks, so things can definitely change in the next 4 ½ months! Well that’s about all I can think of at the time, and it’s looking like this post should come to an end ASAP, based on the length! I’ll try to update with pictures as soon as I can. Hope it’s not another year before I post again! It’s been long enough… I think it’s time for a new post! Since the last post quite a bit has happened in our lives. Taylon and I were married on September 18. 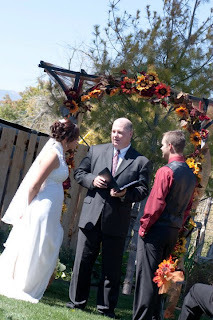 It was by far the best day of my life! So far we have the perfect marriage. I couldn’t ask for a better husband. My Grandma left in December to serve a mission for the Church of Jesus Christ of Latter Day Saints. I am so proud of her! She is loving the experience, and has learned to operate a computer so well. She is so excited she can now read the newspaper online. I think she has learned more in her 70’s than any other period of her life! In March we splurged and went on a 3 day cruise to Ensenada, Mexico! We had such a fun time! 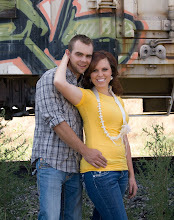 We were joined by Taylon’s brother Chet, and his girlfriend Jessica, my sister Stevie, and our friend Parker. When we were at Port in Ensenada we went horseback riding on the beach. The horses were a little homely, but we had fun. After the horse ride we headed back to downtown, and they were celebrating Mardi Gras. Who knew they had such a big celebration for Mardi Gras in Mexico?? We were able to watch the parade while we waited to go back to our ship… needless to say it got a little rowdy during the parade! It was an experience I wouldn’t hesitate doing again, and again! Several weeks ago we went down to Zions National Park with a bunch of Taylon’s family and hiked “Angel’s Landing.” I’m not exactly sure how long the hike was, all I know is it was straight uphill, and I am SO out of shape! Once we finally got to the top, and felt as though we had conquered the world it wasn’t too bad! The weather was perfect for our hike up, and got a little windy on the way back down. It was a great little break from winter in Sanpete, to enjoy springtime in Southern Utah… although we woke up the next morning in Cedar City to about 3 inches of snow! For the past 2 years I have been the director of the Miss Fairview Scholarship Pageant. The pageant was on April 9. It was nice to get out of the way, because of all of our upcoming stressors. I had a great time directing it, and had so much fun with the girls. I was really happy with the outcome our judges decided on, I just wish all of the girls could be in the royalty. They are all such amazing girls! Recently, we have created a new endeavor for ourselves. We have opened a women’s clothing boutique in Mt. Pleasant. We named it Poise and Ivy, right now we carry just women’s clothes. In the future we will be carrying plus sized clothes, and men’s apparel…we are also planning on getting tanning beds! We have been opened for about a week, so we are still getting acquainted with being business owners…. It has been such a great experience. Taylon is still working as a surveyor at Skyline Mine. I finished working at Sindi’s Salon at the end of April, and have started doing hair, in my off time from the store, at our house. Everything is going great for us, we are as happy as ever. Hopefully life will just get better from here! This past weekend my sister Stevie flew in from Sacramento to throw me a bridal shower. Can I just say how extremely spoiled I felt all weekend?! Friday night on our way to the airport my mom treated me to the Cheesecake Factory, then Saturday we planned a little for the bridal shower and had a relaxing day together, Sunday morning Stevie took Taylon and I to Spring City to shoot bridal/groomal pictures, then we headed up to Fairview Lakes to enjoy a feast at the Ockey Reunion (our step mom's family). 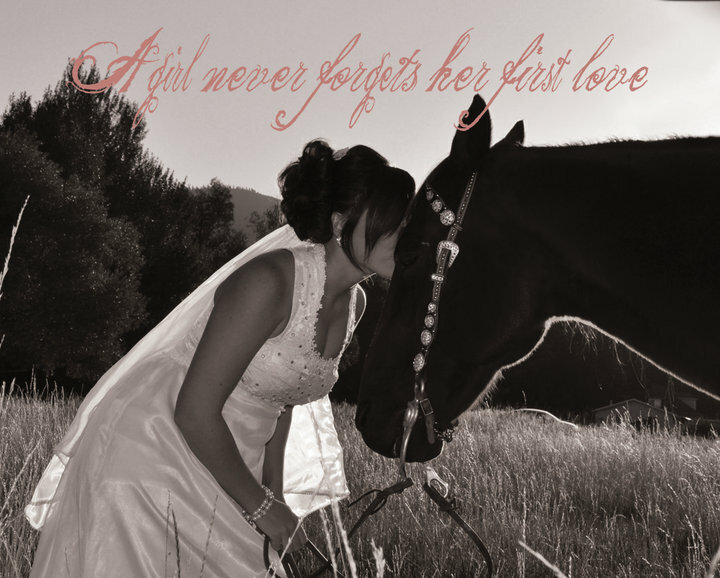 Then Monday morning before we started to gather things up for the shower Stevie decided we should go take more bridal pictures with our horse, Smokey. She said the one thing she really regretted when she got married was not getting pictures with one of our horses. I am really happy that she thought of doing some of my pictures with Smokey. They are PRICELESS! This weekend Taylon is heading up to Montana with his friends to have a bachelor party, and the girls and I are planning on going to 80's night for a bachelorette party. Planning this wedding has been a lot of fun, but we are so excited to have the wedding here, and be able to relax. I am so blessed to have such a talented, and loving sister, and mother, who are so willing to share their talents with me. Stevie has done my invitations, my bridal shower, bridal pictures, special sign-in books for the shower, and our wedding, and she is even planning on making our wedding cake, and a table of desserts for our wedding. My Mom has remodeled her wedding dress for me to wear, and she has gone above and beyond everything we've needed for our wedding. I just hope they realize how thankful I am for all of their help. We purchased our marriage license today! That felt strange. I'm a little skeptical to change my name to Ashlee Earl. Not that it sounds off or anything, just for the simple fact that I can't sign pretty capital E's- I guess I'll have to learn how, and get over that phobia. Maybe that's a little shallow of me. After being with Taylon for nearly five years I thought I wouldn't love him as much when it finally came time to marry him, but the weird thing is that I am falling more in love with him everyday. I hope that is how the rest of our lives together will continue to be. We also received our invitations in the mail today. We had a friend of ours that has recently started her photography company take our engagement pictures, then my sister Stevie designed the invitations for us. I am really happy with how she designed them. We decided to send them as postcards, so watch for them in your mailboxes! Besides wedding news, our sister Brittany is going to have her baby boy anytime now. We are all so anxious and excited to meet little Landry. Honestly, I thought he would have been here by now. I think he's just proving his point that he will come when he is good and ready, and not a minute sooner! I'm sure he is going to be well worth the wait. So I haven't written at all this summer. I'm not sure if it's because I've been too busy to spend time writing, or if it was that I didn't have anything interesting enough for everyone to want to read. Anyhow, any of you that will be reading this will know by now that Taylon and I have decided to get married next month, if you didn't know- now you do. Wedding plans have gone pretty well so far, but I'm sure everyone around us is preparing for me to turn into bridezilla. Hopefully that won't happen. Well, there is a little tid bit of information to fill you in on our lives. Let's hope I can keep up on this blog a little better than I have in recent history. I am Ashlee Earl. I've been raised in Fairview, chased around a couple of dreams out-of-town, and my heart always managed to lead me home. 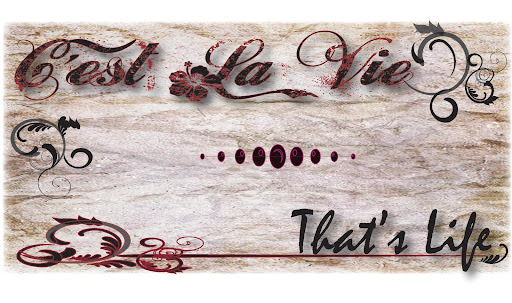 I own Poise & Ivy, a clothing boutique in Mt. Pleasant, Utah. I am not just 'satisfied' with life, but infatuated with it. I love every second of life, and everyone that makes it what it is. I love warm weather, animals, Desperate Housewives, and most of all my family!